This guide shows how you can set up YajHFC for small work groups. This means that the read/unread state is shared between different computers by storing that information in a database table on a server. 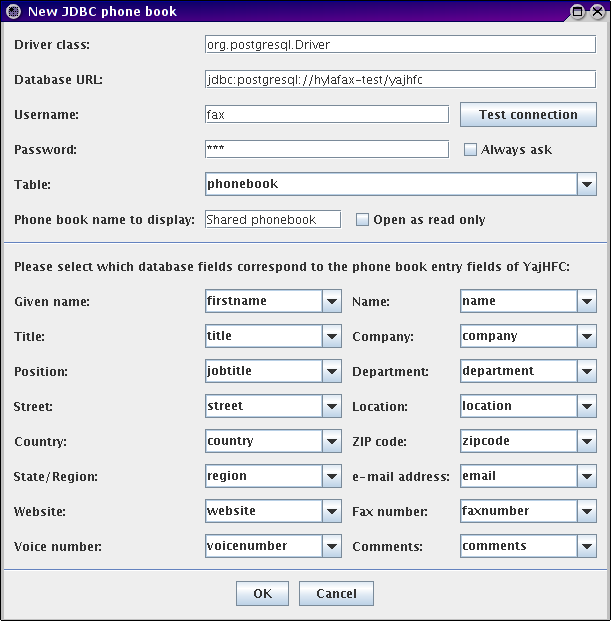 Additionally the database server is used to create a shared phone book. In this guide PostgreSQL (version 8.1) is used as database server. YajHFC also supports other SQL compliant database servers like MySQL or Apache Derby. It is absolutely no problem to use a different database server (YajHFC only uses basic SQL), but of course the set up of the database server and the JDBC settings for YajHFC will be different from this guide. See below for the structure of the necessary database tables. The commands in this section were tested on Debian/Ubuntu. They should be similar on other distributions, however. Install PostgreSQL: If not already done, the first step is to install PostgreSQL. If you use Debian or Ubuntu you can do this by entering the command aptitude install postgresql. In the next step PostgreSQL has to be configured so that the databases can be accessed over the network using username and password. To do so, you'll have to edit the files pg_hba.conf and postgresql.conf. You can find them in the directory /etc/postgresql/<version>/main if you use Debian/Ubuntu, or in /var/lib/pgsql/data for OpenSUSE. On other distributions these files might be in a different place. 192.168.X.0/24 has to be replaced by the adresses of your local network in CIDR notation. That means: If you use IP adresses of the form 192.168.115.X in your network, you will have to enter 192.168.115.0/24 here. Finally use this script to create the necessary database tables and users. As a default the script creates one user named "fax" with password "fax". If you want additional users or a different password (recommended), please edit the script before performing the next command. 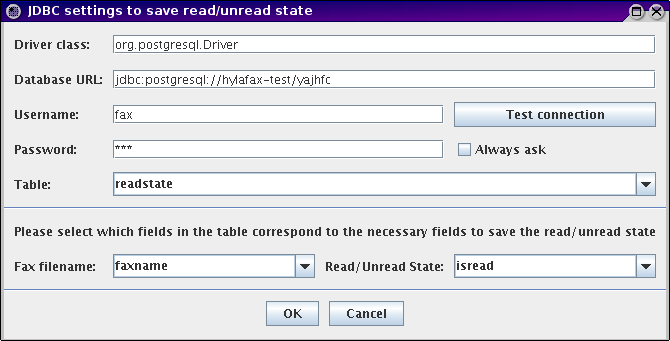 Start YajHFC, open the Options dialog, add the newly downloaded JAR file as JDBC driver (Options->Plugins & JDBC->Add JDBC driver) and click OK.
Open the Options dialog again, set the save location under Server->Read/Unread state of faxes to "Database table" and click "Configure...". In the database URL you have to replace hylafax-test with the database server's host name. The other settings shown above can be used without modification (if you set up the database server according to this guide). Remark: "Test connection" should be successful here. Close all dialogs by clicking "OK". You will have to modify the database URL in the same way as above here (use the same URL in both cases). Remark: "Test connection" should be successful here, too. Fax file name Text (variable length character data), should have space for 20 characters (i.e. VARCHAR(20)). This field should be the table's primary key. One database field for every phonebook field. Data type for all fields is text (variable length character data); should be sufficiently long (at least 30-40 characters; for example VARCHAR(40)). For the comments field, using arbitrary length text is recommended (i.e. a TEXT/MEMO field).